This Tunnels & TrollsTM mega-solo adventure is 98 pages long with over 50 pen & ink illustrations, most never having been seen before. Every page has at least one illustration on it. 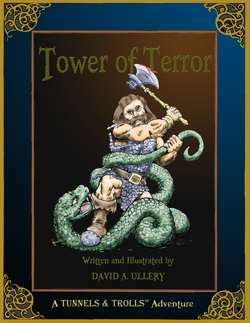 Tower of Terror takes place in an old wizard's tower that has been sealed off, and is now currently used by the worshipers of Ophion, the serpent god (aka Set). Expect many slithering snake-like opponents as well as a bunch of regular type of enemies to overcome. Much treasure is to be had as well as attribute enhancements. There are two ways to play: you may go through 16 short individual adventures, or for longer more advanced play you can go on the "Trip of Terror" involving the 16 original as well as two others for a total of 18 adventures. Some lower level spells are allowed, but this is mainly for warrior/fighter types. While most of this is for second level characters or higher, there are a few easier adventures in Tower of Terror. Also more than one may go through at a time, but you will need to multiply the opponents by the number of adventurers (naturally).